A major coup this week was meeting with Sam Bahour. A friend first told me about him, years ago, constantly sending me forwards from Sam. Finally I put myself on the list and have appreciated his original writing and his choice of forwards. I’ve used some of them in my work, for my list, such as his recent account of the targeted assassination near the Nazareth and Osama restaurants. A big fellow, maybe 6-4, somewhat bulky, his mouth curves graciously into a middle peak. He throws himself into talking about his many projects, as a pitcher might wind up on the mound and let loose a stinging fastball. His current project is organizing a newspaper focused on local events, writing in Arabic, but translating selections with wider appeal and syndicating them to the international media. He claims his project would overlap and not conflict with This Week in Palestine because of his emphasis on local news written in Arabic. He’s working with partners, including Fred Schlomka who I met in 2003 when pondering how to first travel to the area. Fred was an Echoing Green fellow working on a mixed Arab-Jew housing project called Mosaic. We were startled, Sam and I, to realize we both know him. I was recommending Sam look into the Echoing Green fellowship for socially beneficial entrepreneurship when Fred’s name arose. Born and raised in Youngstown Ohio by a Palestinian father who was a grocer. Arrived here in 1994 at the height of Oslo, just one year before Rabin was assassinated and Oslo caved in. He was 30 in 1994 making him about 43 now. His background is in information technology and business development. He is married to a Palestinian woman and so the question of where to live was clear. His only hesitancy was last summer when Fatah and Hamas openly warred against each other. He said if civil war broke out he would seriously consider leaving. He believes the threat of that now is reduced. With an MBA he has embarked on a serious of innovative entrepreneurial projects, most notably the Plaza Shopping Center in Ramallah. He took me to it. I’ve sought it for years, hearing it lauded, knowing it is somewhere north, off the road to Birzeit past the Muqata (Presidential Compound). I have to confess, partly because we were riding at night, partly because of conversational engagement, I still do not know how to find it. Except by wandering around that general area and asking—Plaza? Mall? Big shopping center? 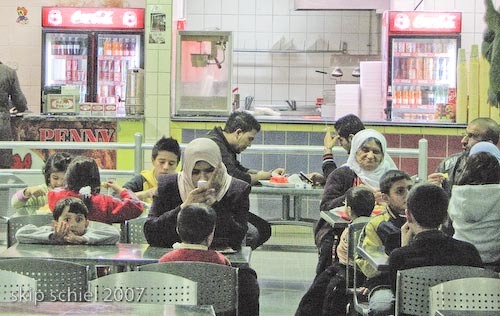 The center now has 3 branches, one other in Ramallah which I’ve shopped at, the Bravo Supermarket near the Palestinian Hydrology Group, and in Hebron of all places. Both are supermarkets only, not the entire complex of shops. The main center looks like most smaller strip malls in the USA, with a 4 unit food court, kids’ play area with the theme of jungle, series of ground floor shops, main café, and the supermarket itself. I could write extensively about what I learned from Sam about this—deciding not to boycott all Israeli products but instead to foster Palestinian economic growth thru jobs and startups, orienting security to helping people rather than policing them, doing all the baking under one roof, exploring pricing and margins to reduce costs thereby antagonizing local marketers who Sam feels had been charging exploitative prices, etc—but I won’t. Sam promised the story had been fully covered by media, national, Israeli, international. One remarkable point in the story is that Sam decided to buy an Israeli computer checkout and inventory-keeping system. Cheaper, more realizable, more local, despite it coming from the adversary. Sam is proud of the fact that the project persisted and succeeded—his role was project manager, then CEO then Chairman of the Board, not owner—thru the 2nd intifada. Many thought the project would fail. Sam was stalwart. It opened about 3 years later. Also in 2000 a competitor began building a similar complex across the road from the Sam’s. He showed it to me: incomplete. One person who ran out of money had financed it. A group financed Sam’s and they were able to continue the funding. Stores are opening in the same neighborhood, some mall-like buildings are competing (United Colors of Benetton moved out of the first complex because of high rents and into the second complex which offered lower rents). And some are ancillary, such as a florist. This is much like what happens when light rail opens: development. I asked Sam, “Isn’t this mall dangerously near consumerism?” He nodded in assent, and added, “To Americanization. Yes, true, but Palestinians wish to have what many in the developed world have. Who am I to deny them this? 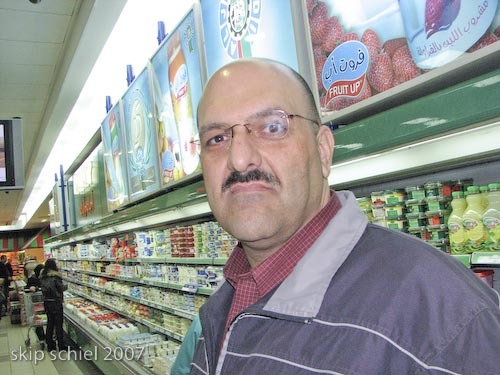 In addition it provides jobs, some 200 here, and it grows the economy.” Sam had told me earlier that Palestinians have found a way to not lose, but have not yet discovered how to win. A partial answer is thru the economy. Many of the investors are international, a preponderance from the USA (reflecting the USA-Ramallah connection), franchises, none of which I’m familiar with. Sam’s first project in Palestine was to help privatize the telecom industry, Paltel, which recently purchased Palnet. This was post Oslo, just as Arafat returned from Tunisia where the PLO had been in exile. Sam serves as a consultant to the Ramallah Friends School, helping them with the development of their football/soccer field and later with a complete renovation of the landscaping on both campuses. Currently a regional Arab company is organizing a new telecom company but is stymied by Israel’s refusal to relinquish more of the airwaves. Yet another aspect of the matrix of control, invisible to most people, unlike the Wall and checkpoints. How to make this visible and real to people? we pondered. He is voluble, gracious, happy-looking (mubsut in Arabic), and worried about a number of issues, civil war the primary one, denied entry another. He told me, how do you think it feels, living for 13 years here and every 3 months needing to leave the country to renew your visa—and then you’re not assured of re entry? This impedes planning. The Israelis claim we don’t plan; we ask, how can we with so many uncertainties? Sam is part of the Campaign for the Right of Entry/Re-Entry. He also maintains an electronic news mailing list which seems mostly forwards rather than original writing. He promised to send out something last night of his own. Near the end of our visit I said, Sam, maybe your next project can be a public transit system, even light rail as the Israelis are running (illegally) thru East Jerusalem. He smiled, replied, it’s in the works. He told me about a new quasi-governmental entity that is planning projects such as a bus system for Ramallah. We agreed that the traffic problem here is tremendous, on roads, he noted, designed more for donkeys than for motorized vehicles. I mentioned my observation that many shops, day and into the evening, seem to be occupied by one lone male, sitting there with nothing to do. At times a friend might accompany the shop tender. Yes, Sam said, and I believe this might dissuade customers, especially women who might not enter if they saw a single male figure. There is also the forlorn, lonely, abandoned feeling we might get when looking into such a shop. Where are the customers, we might ask, why is this place so empty? We discovered a South African connection. He told me about a radio station apparently owned and operated by South Africans in this country, RAMFM 93.6. They broadcast from Ramallah, Jerusalem and Tel Aviv to Palestine, Israel, and South Africa, plus the entire world I assume. Each morning at 10 they do a talk show. So when I mentioned my connection with South Africa and my recent analysis of the situation in Israel-Palestine, and how I dove into a compare-contrast exploration of SA and Israel-Palestine, he lit up. Maybe they’ll have you on, he said with some excitement. End notes: Sam’s consulting group is Applied Information Management, he’s the Managing partner, phone 02-298-1566, 0599-378-278, sbahour@palnet.com, http://www.aim-Palestine.com. And the company he shares with Fred and others is North Bridge Investments Limited, 059-937-8278, sam@northbridgeinvestments.com, http://www.northbridgeinvestments.com. Imagine my surprise when your post popped into one of my Google alerts. Nice article. Sam and I are trying to integrate business activities with our desire for justice and peace for the region. It’s an uphill battle but we’re here for the long haul. I haven’t been in Palestine for 10 years and I was surprised to see some progressive enterprises there in spite of all the negatives we read. Every little bit helps. Your information are very good.I like it.